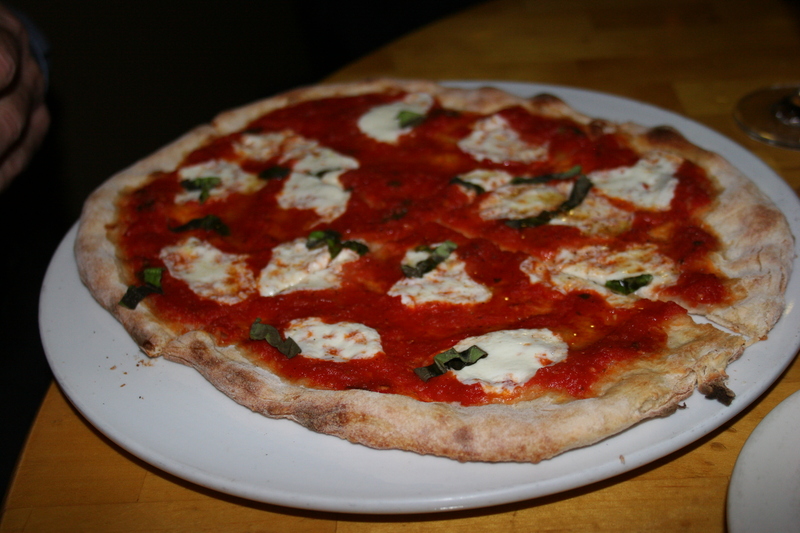 Is Bona Cucina the best restaurant in the Delaware Valley? No, not really. However, I don’t think I have been to another dining spot in Philly or South Jersey that so consistently serves great food at such unbelievably low prices. 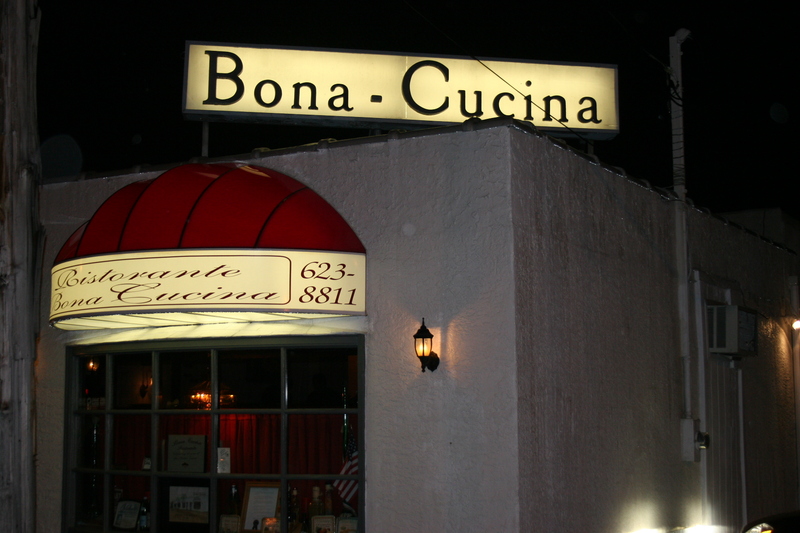 Bona Cucina, at 66 Sherbrook Drive in Upper Darby has been a local favorite for almost 25 years. Pat and Frankie Buonadonna (Pat is the chef and Frankie runs the front of the house) have been serving meals to hungry diners with a quality and consistency that has folks returning often, myself included, and I live some distance away in South Jersey. This fantastic restaurant has one of those menus where everything is tempting and it has been years since they have raised prices on their entrees or appetizers . It’s not a big place with perhaps 50 seats but it has a relaxed atmosphere and after one or two visits you’ll feel like family. I caution you that Frankie can be slightly irreverent but that only adds to her charm. She takes great pride in everything her husband sends out from the kitchen. You will seldom, if ever, see Pat in the dining room, it’s just not his world. He prefers to lose himself in the wonderful food he is preparing. 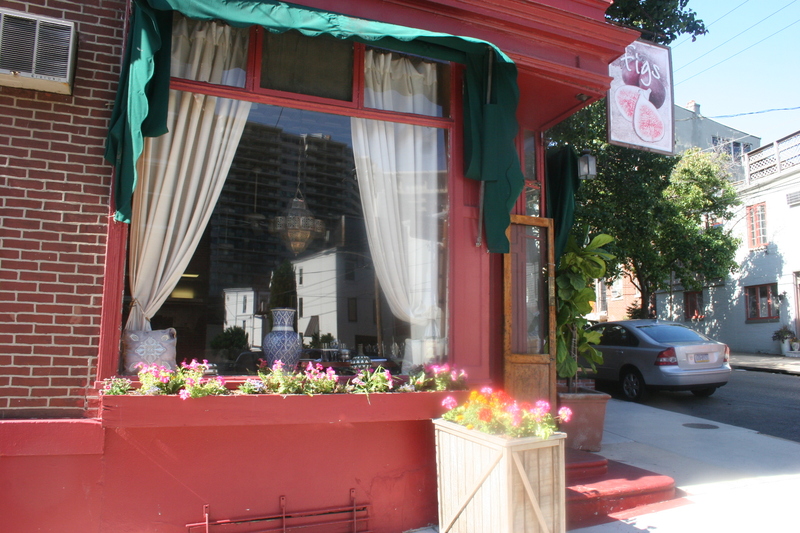 A large group of friends that I gre up with in Drexel Hill have been going to Bona Cucina for several years. My wife has heard me rave about the place so many times that last Sunday she insisted I take her, and my sister, who was celebrating a birthday for dinner. 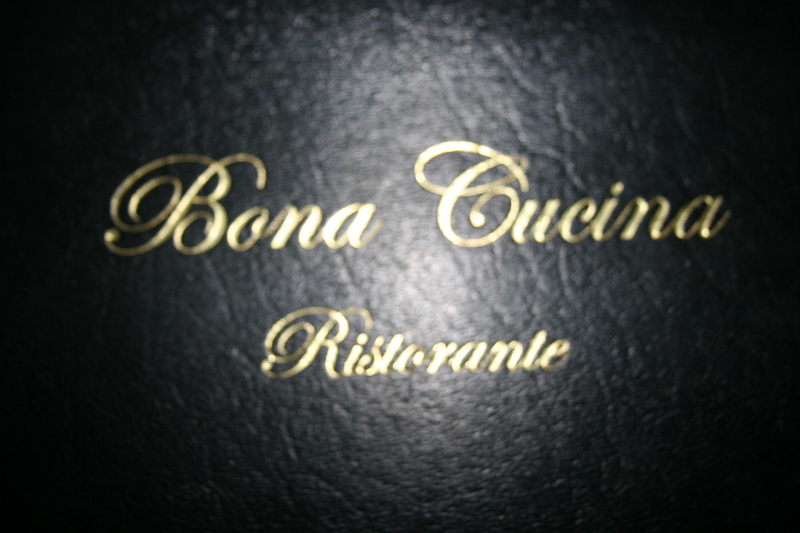 Since her meal, I have heard her telling others about how delicious the food was at Bona Cucina. It’s not a place I read about often when great restaurants are mentioned but, that’s OK, business is booming and maybe it’s best if it stays a local secret. 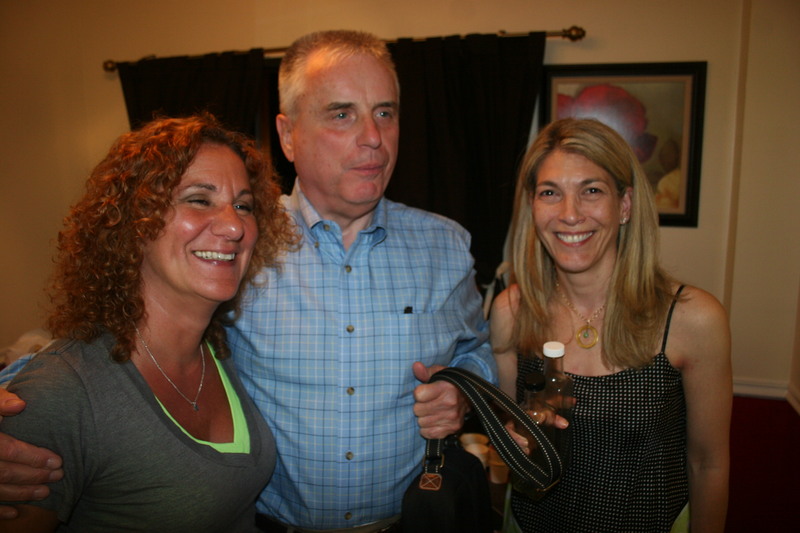 I was able, on one occasion, to coax Pat out of the kitchen for a photo of him and Frankie. They are rightfully proud of their restaurant and I am happy to be able to award them my very first QVC Award for Quality, Value and Consistency. Keep up the good work! It’s hard to believe that it had been over three years since the three of us had been together at Teresa’s in Wayne, PA for one of our frequent wine dinners. 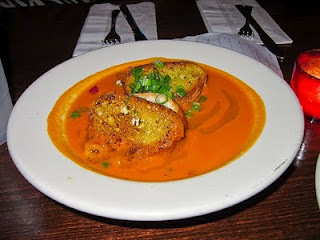 It’s a place we have frequented quite often and was one of the very first reviews I ever did on this blog. How time flies. Anyway, it was nice to return and we were given what we almost think of as “our seats” right by the front window. 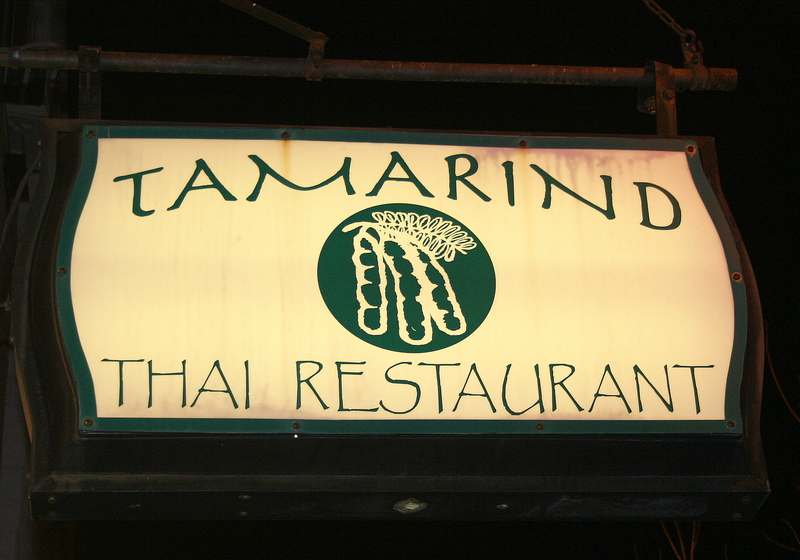 The food and service are always good at this Main Line eatery and tonight was no exception. You would have thought that as many times as we had dined together that Gerry, John and I would have used up every conceivable insult known to man but, not surprisingly, all came prepared with a host of new derogatory comments which leave no room for tender feelings. You can interpret that last sentence as meaning we totally enjoyed each others company. As usual we had some very nice wines with us, all of which did their duty in enhancing our dining experience. Gerry brought a 2008 Apex, Columbia Valley, Cabernet Sauvignon. This is a Washington State wine from the that I used to see often at Total Wines in Cherry Hill but I’m quite sure he purchased it at a PA State Store. 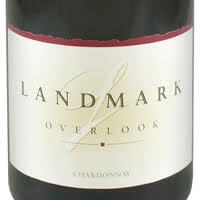 It had a nice nose of red berries and chocolate and was well-balanced on the palate. 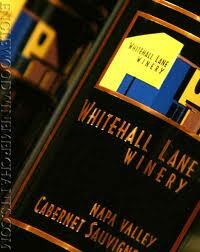 John had a 2007 Padeletti, Brunello di Montalcino which was another of his purchases from Wines Till Sold Out (WTSO). I’m not sure I would have trusted this site for a Brunello purchase but this one did not disappoint. It had a beautiful nose with lots of typical bright cherry flavors in the mouth. Deep, dark and intense it was a nice companion to our food and proof that the 97 Brunello vintage was one of the best in Italy. 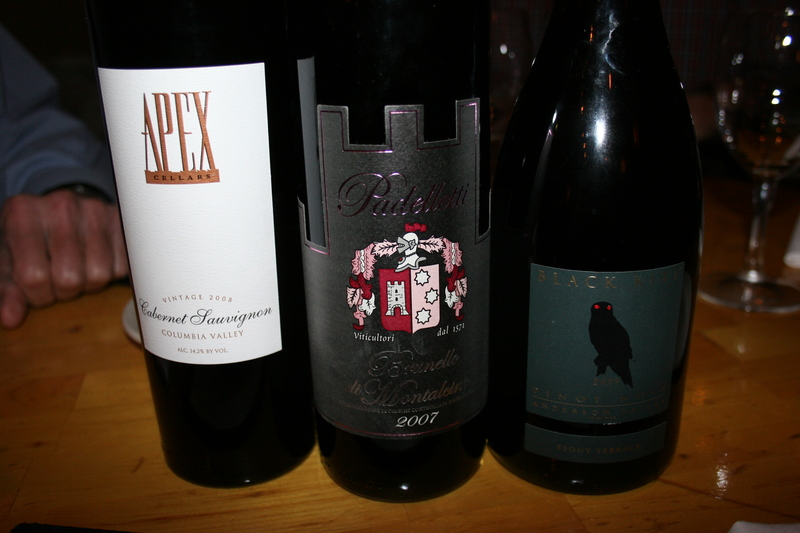 My wine for the night was a 2009, Black Kite, Anderson Valley, Stoney Terrace Vineyard, Pinot Noir. This is a strong, intense Pinot with lots of plum and raspberry notes, very smooth in the mouth with a soft, lingering finish. Everyone commented on this one. It’s tough to pick a winner from this group. They were all nice wines. 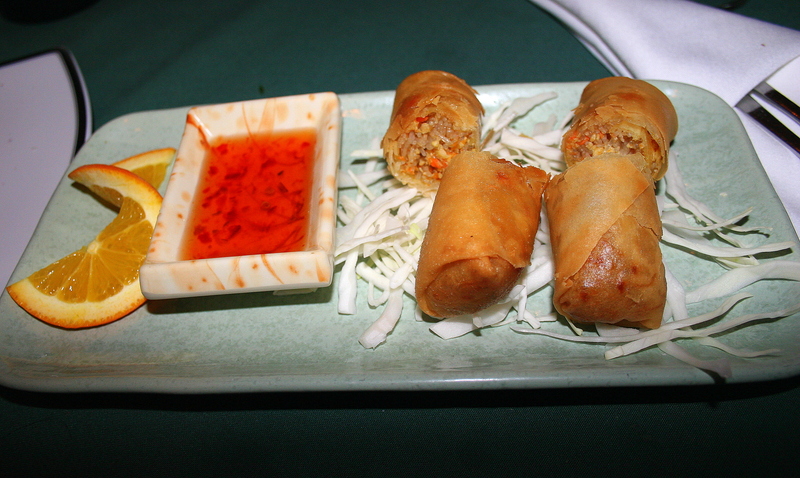 Each of us started our meal with an appetizer of one sort or another. 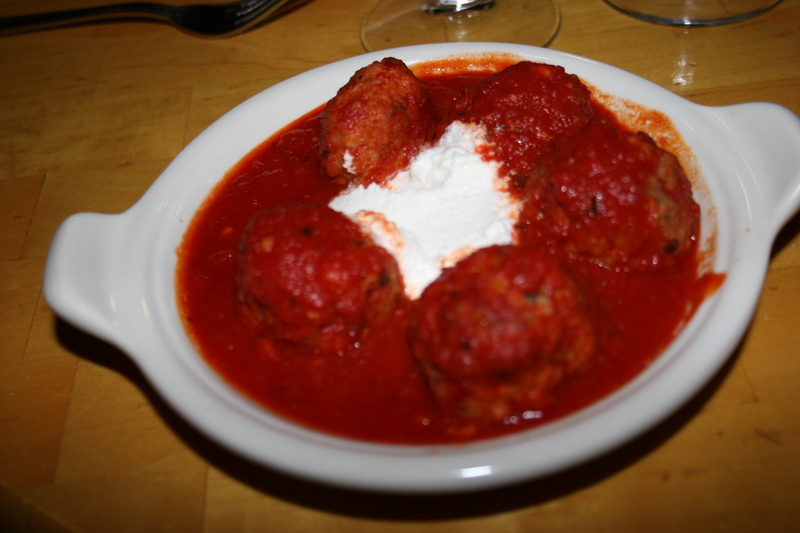 John had the Margherita Pizza, I had the meatballs and Gerry had a bowl of soup. All of them were excellent as usual. 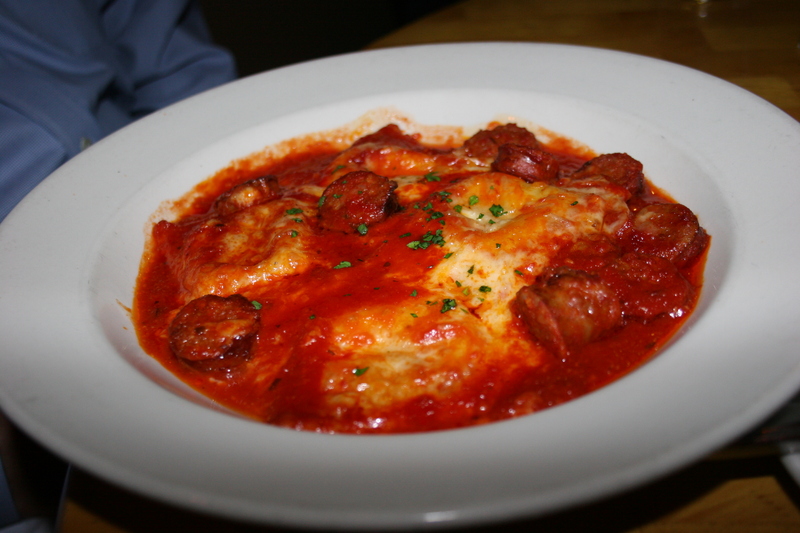 John selected the Four Cheese ravioli as his main course and had them add some spicy sausage to the dish. 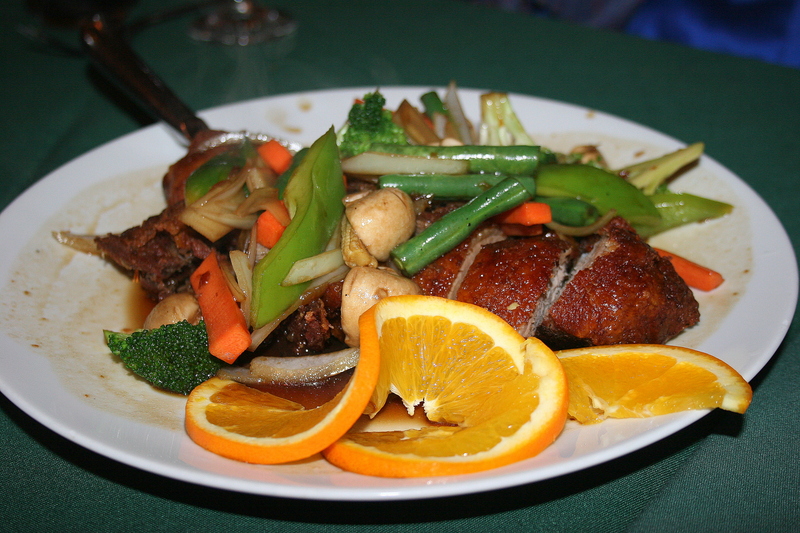 It was excellently prepared, full of great flavor and the meat helped him experience one more food group on his plate. It’s hard to get Gerry to choose anything at Teresa’s that isn’t the Penne Al Forno so we have given up trying. We also don’t blame him as I consider it a truly wonderful dish which I have had more than a few times. 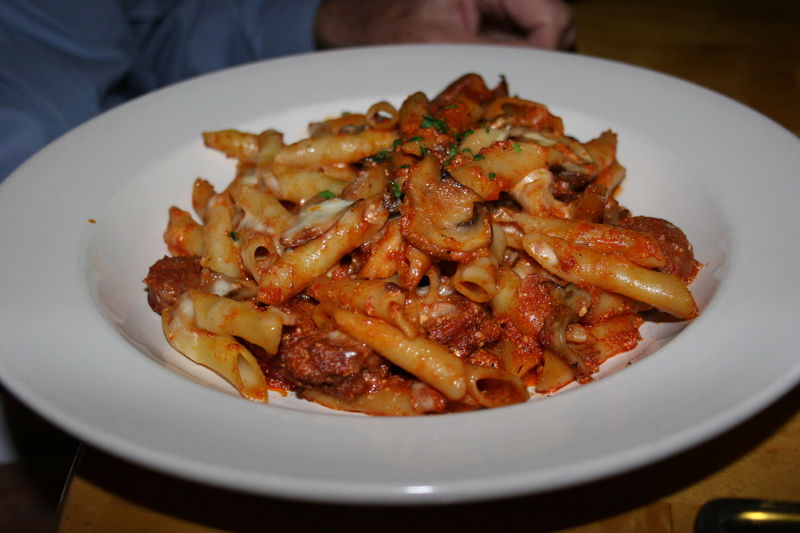 Baked penne, hot sausage, marinara, ricotta and mozzarella all married in one spicy dish. There was nothing about his meal that will having him changing his entree on his next visit. 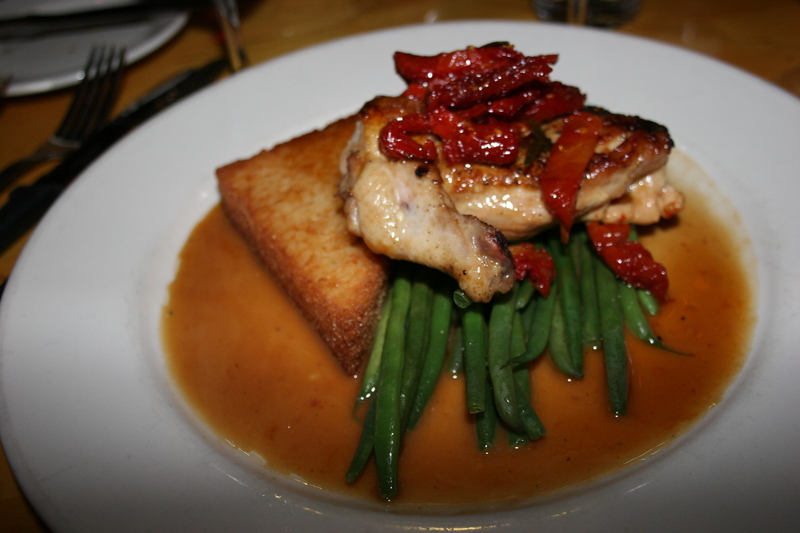 I ordered the Chicken Rosemarino, roasted chicken breast, a risotto cake, haricut verts and sun-dried tomatoes. Nicely done chicken breast with fresh green beans in a tasty sauce. No complaints about this one. We did have just the tiniest room for dessert and John finished off his dinner with a scoop of ice cream small enough to be described as minute. 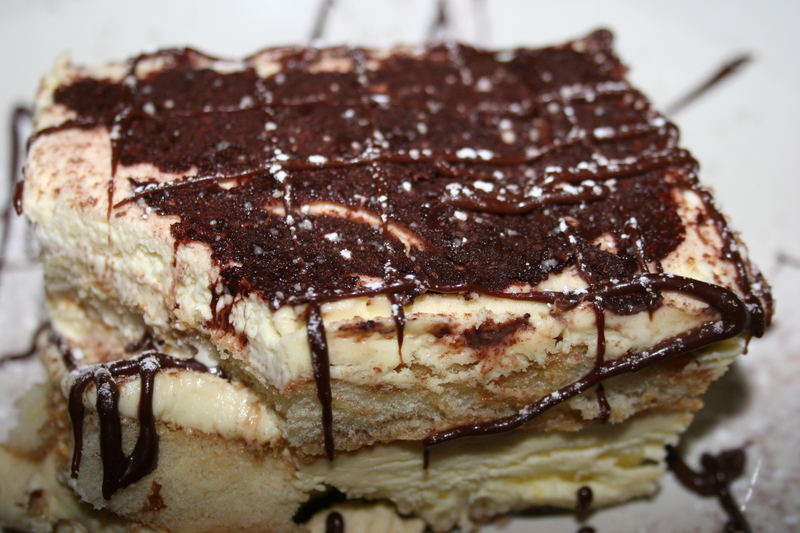 My Tiramisu was a healthy portion and it was an excellent representation of the popular meal ender. 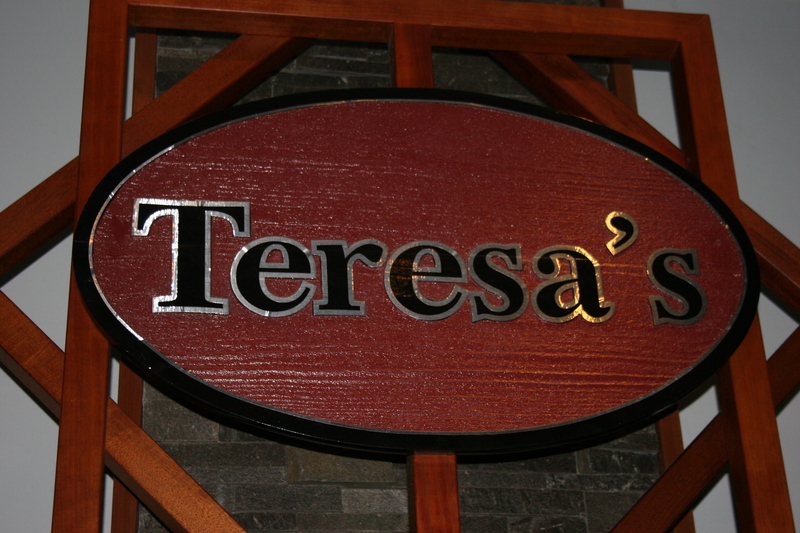 Teresa’s Cafe has been a Main Line institution for some time and their consistency of food and service has made them a great choice for dinner, any day of the week. 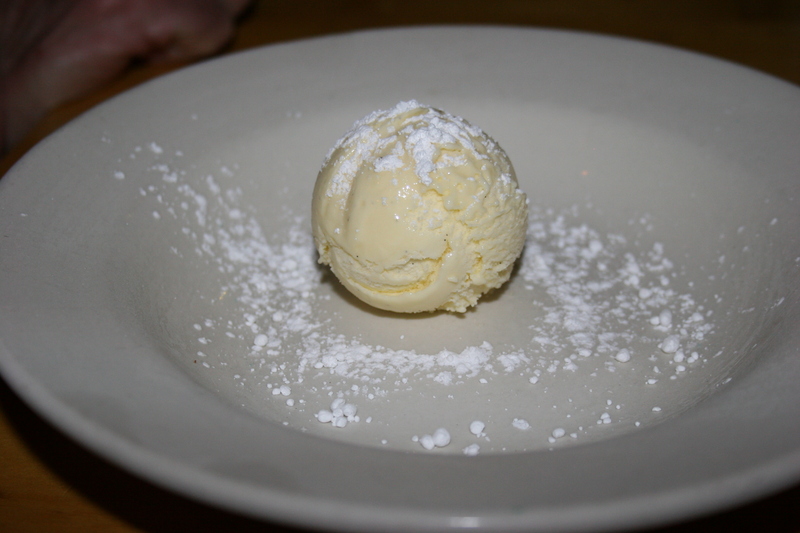 I don’t think I have ever had a post on my blog in praise of a single, specific food item. I thought long and hard about doing this but, in the end, this culinary masterpiece is deserving of this singular praise. Allow me to set the scene. 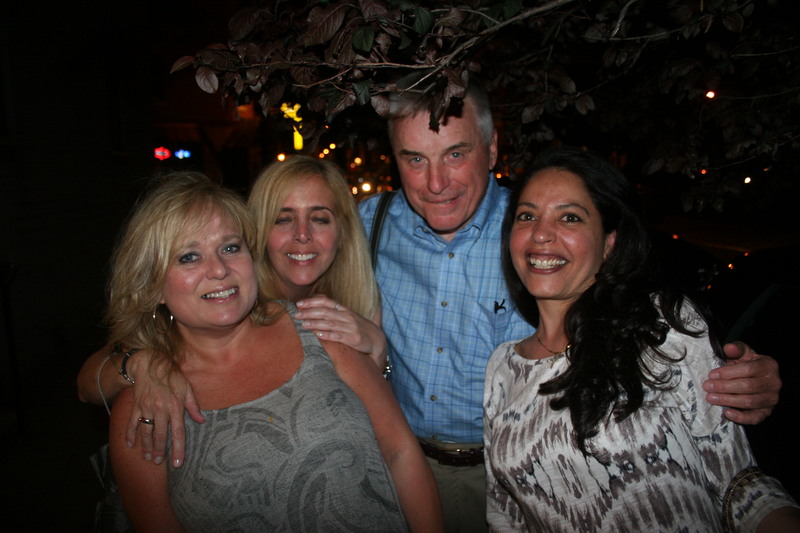 Eight of us were at The South Philly Tap Room on a Friday evening. I did not even bring my camera as I had no intention of blogging about the SPTR because I knew we’d all be drinking beer instead of wine. In attempting to choose a starter for the meal my eyes kept coming back to the Tomato Lager Soup. I have no idea why because I am not a huge soup fan and tomato soup would be way down on my list of soups to select. Nonetheless, for some unknown reason, I did order the Tomato Lager Soup. It was phenomenal!! A hot, tangy tomato bisque made with Yeungling lager and garnished with just the right amount of spices to give the liquid some real magic. If I stopped now in my description this would have been a delicious starter. What made it a truly awesome were the two little grilled cheese sandwiches on toasted crostinis swimming in the middle of the soup. The taste, the texture, the total experience was a foodies dream. I still keep telling myself it was only a bowl of soup but it was sooooooo much more. Even more amazing, if I remember correctly, it was only $6.00!! I’m sorry, I gotta go make a call to the South Philly Tap Room and see if they make deliveries. 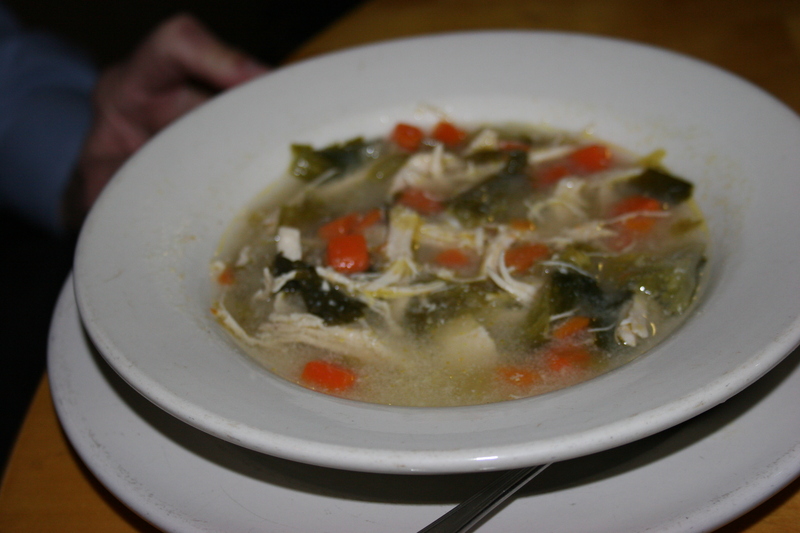 A Sunday visit to the Michener Museum in Doylestown, PA provided an opportunity for four couples and a lovely, unattached lady to dine at Francisco’s On The River in Washington Crossing. It’s not an area that my wife and I get to very often as it’s quite a drive from where we live in South Jersey. 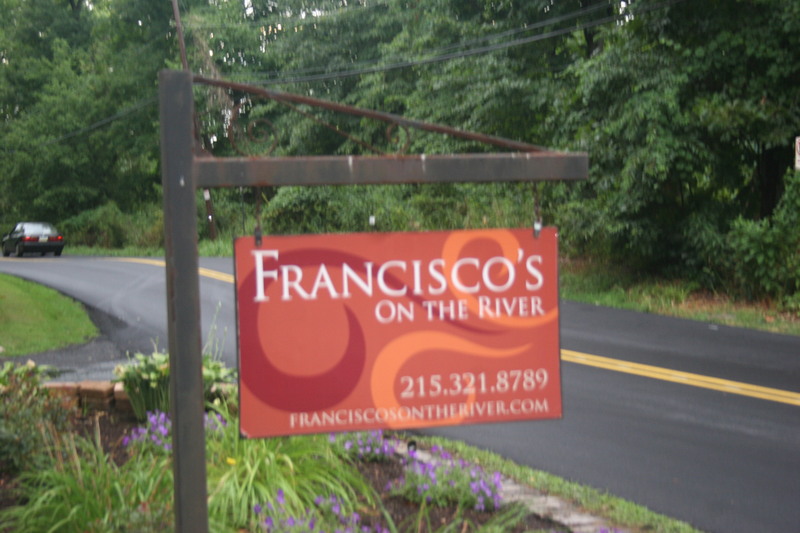 Nonetheless, having weathered a brief summer downpour and watching the sunshine return to the Pennsylvania countryside, Francisco’s location on the Delaware River provided the perfect setting to end what had been a fun day. As usual, we had some nice wines to go with our meals. 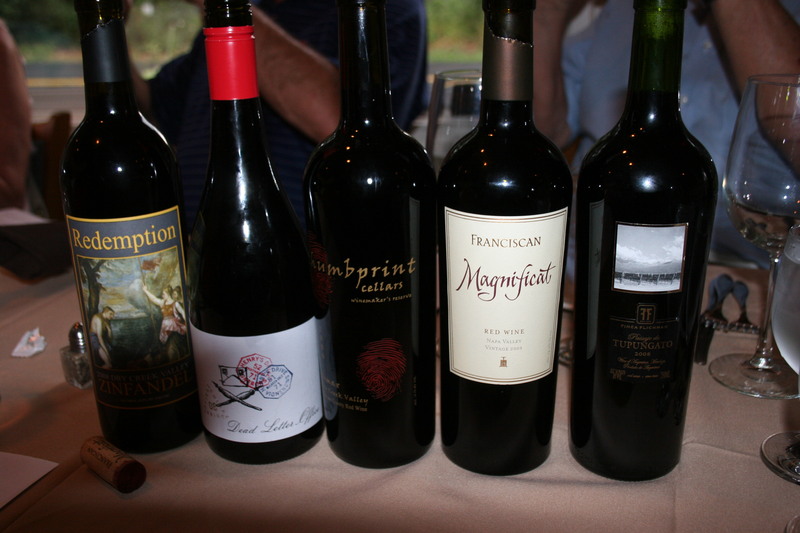 Among them were the (left to right) 2009, Alexander Valley/Dry Creek Valley, Redemption, Zinfandel, the 2008 Henry’s Drive, Dead Letter Office, Shiraz, the 2009 Thumprint, Dry Creek Valley “Climax”, the 2005 Fransiscan, Maginificat and the 2008 Finca Flinchman, Tupungato. All of the wines were excellent and all of them were wines we had enjoyed on previous occasions. 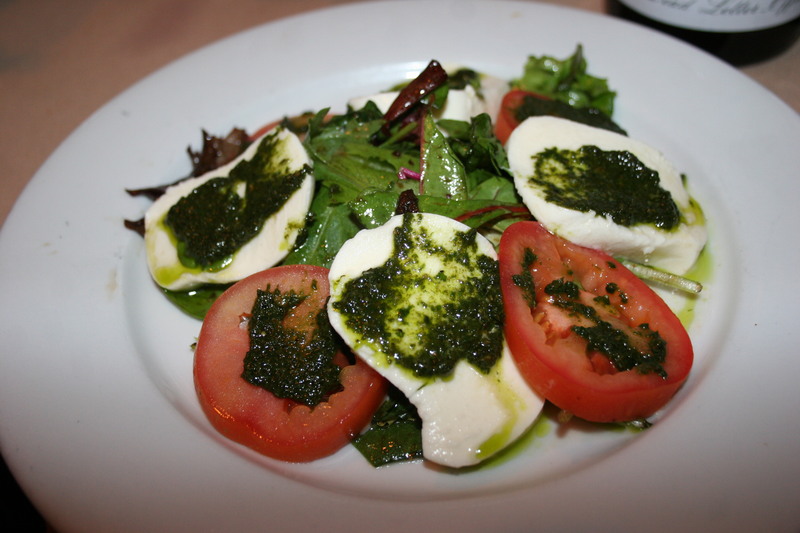 I didn’t get pictures of everyone’s food but some of us started our meal with salads, mine was the Blueberry and Pear Salad topped with Goat Cheese, another was the Crabmeat Salad over spinach and arugula and topped with a raspberry vinaigrette and the other was a Caprese Salad with pesto. 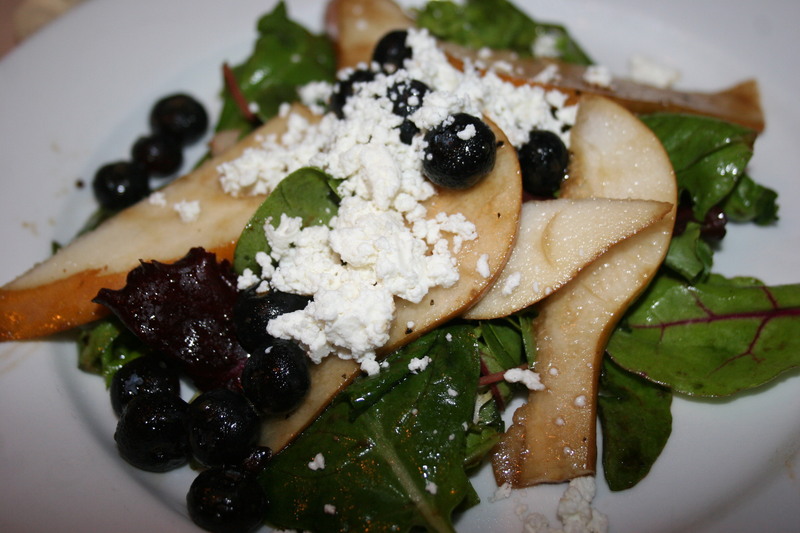 All of the salads were fresh and flavorful. For my entree, I selected from the page of “specials”. This one was called “Bob’s Plate”. 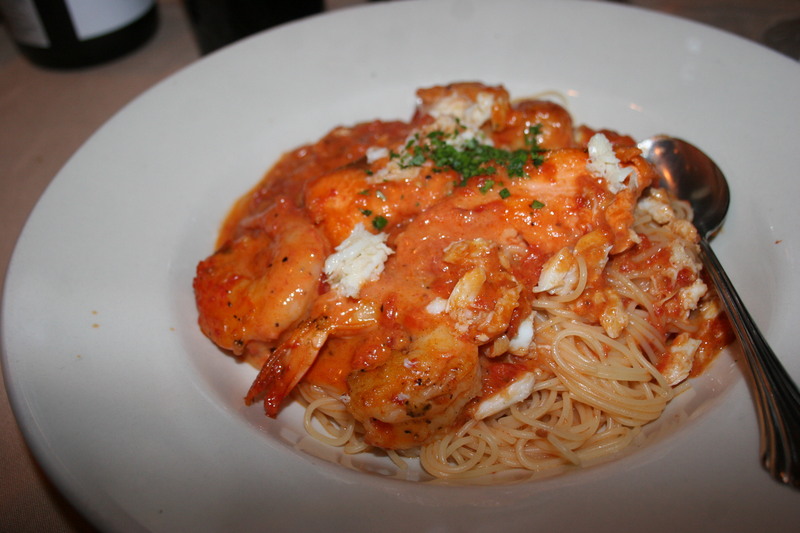 It was nice of Bob to share his plate with me and I was happy to see that his plate consisted of scallops, shrimp, salmon and crabmeat (yaaaaaaay, no mussels or clams) served over capellini in a vodka pink sauce. 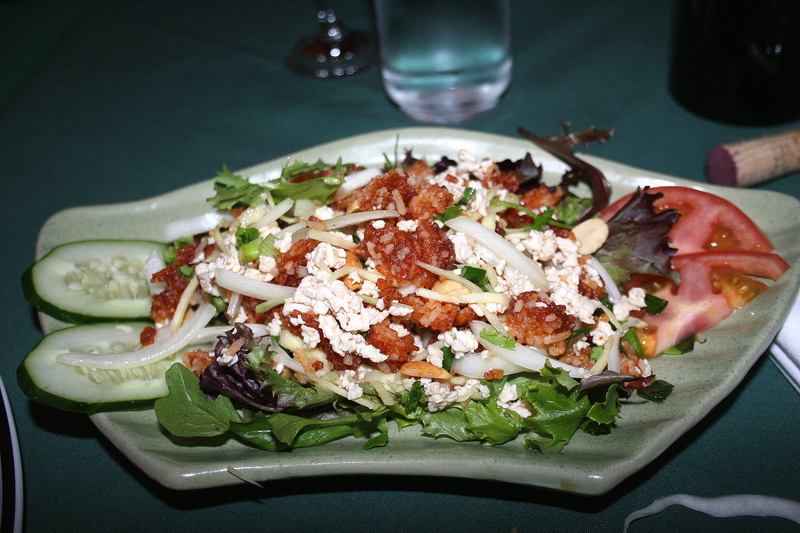 The dish was delicious and the portion large enough that it provided a nice meal on the following night. I did not get a picture of the Eggplant Parmegian that two of the wives ordered and raved about, not only the taste and quality but the huge portion. 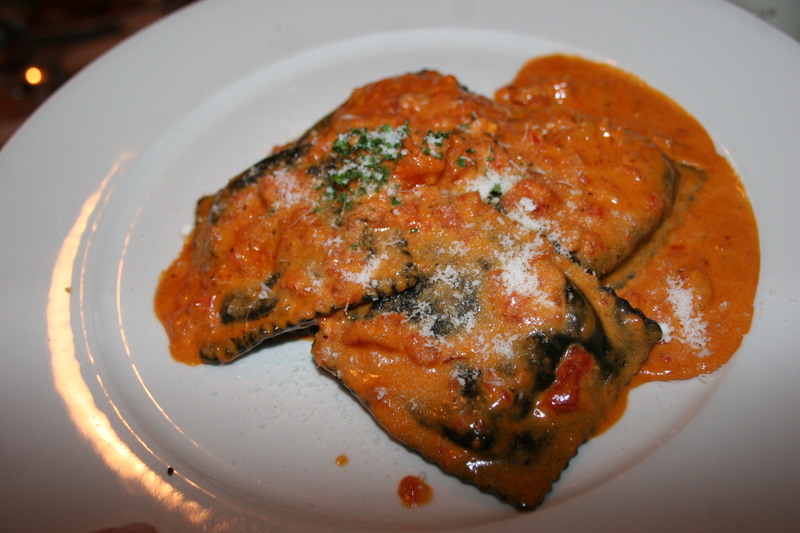 I did get a picture of the Lobster Ravioli, black ravioli stuffed and served in a light lobster sauce. One of the guys went with Francisco’s Lasagna, layers of pasta, ricotta cheese and bolognese flavored with porcini mushrooms and smoked bacon and topped with mozzaerella cheese in a red sauce. 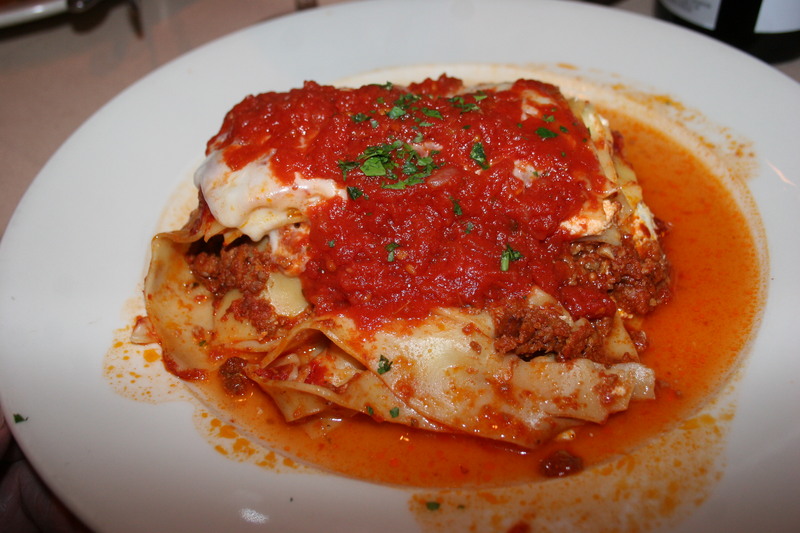 It appears Francisco knows what he is doing when it comes to turning out a great lasagna dish. Everyone appeared to enjoy their meal and the long trip was certainly worth it. 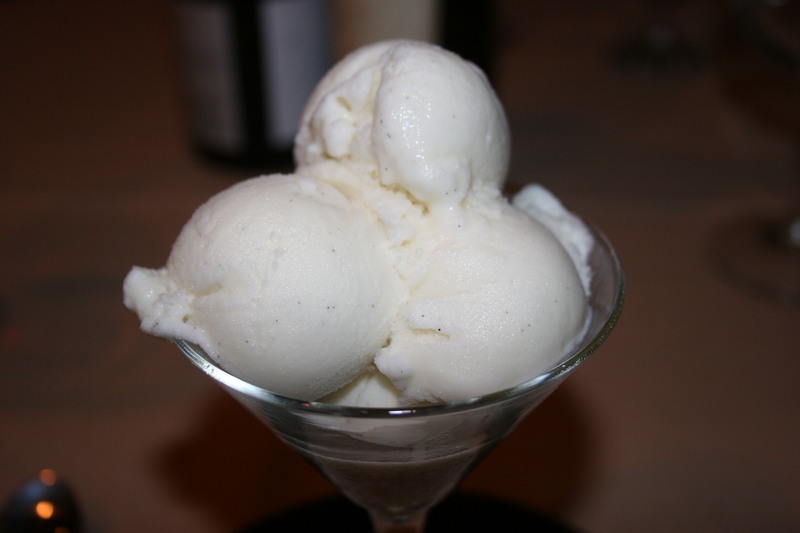 I finished off my meal with a dish of Vanilla gelato and chatted with the ladies while my male compatriots moved across the street to partake of their filthy habit of ending a great meal with an obnoxious cigar. They make every effort to entice me to join them in their evil ways but I have thus far been able to resist. (as is eveident by the empty chair). Francisco’s On The River is a fine place for a great meal. With our “Hall Pass” securely tucked into our wallets and our wives sipping frozen cocktails in St. Maarten, Gerry, John and I were about to finish off our day with a visit to Fond, a highly regarded BYOB at 1617 E. Passyunk Ave. in the heart of South Philly. We had just finished watching the Phillies lose another game at Citizens Bank Park. Gerry and John were staying over for the evening at the Bella Vista B & B and we had just showered and changed clothes in preparation for our much-anticipated reservation at Fond. 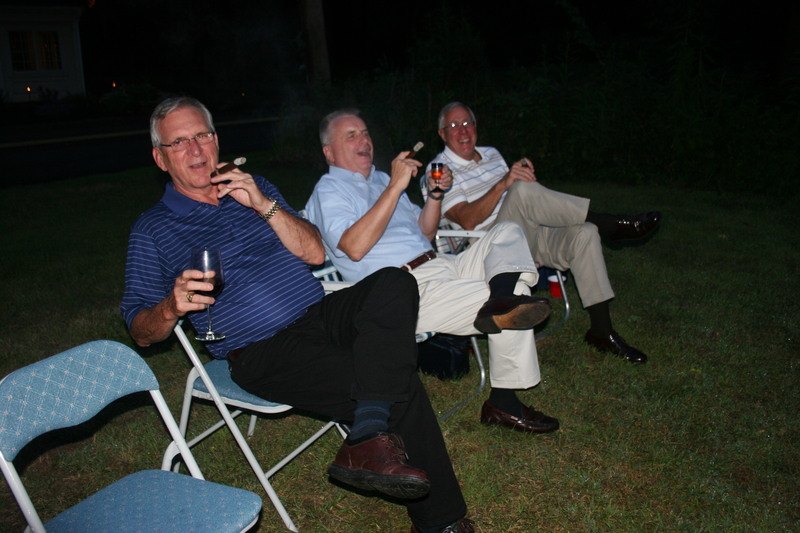 During their pre-dinner cigar John asked if mediocre service would put a damper on a meal where the food and ambience were both first-rate. We finally agreed that it might not have too much affect as long as the service was adequate while other factors were top-notch. 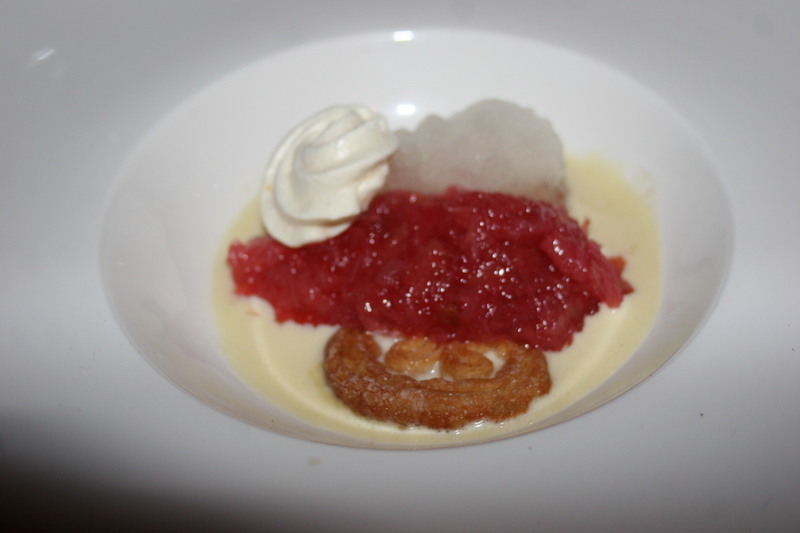 Ironically, we were only about an hour from changing our opinions, not because we ran into poor service at Fond but rather the opposite; we were shown emphatically just how much GREAT service can add to the overall dining experience. This would be Steve, our server at Fond. I had read somewhere that he was recently named the Top Server in Philadelphia. He reluctantly confirmed that he had indeed been singled out for that high praise. After two hours of watching him perform great feats of customer service, the three of us concurred with whomever made that selection. Steve was professional, extremely knowledgable and exuded a sense of pride in himself and his restaurant. 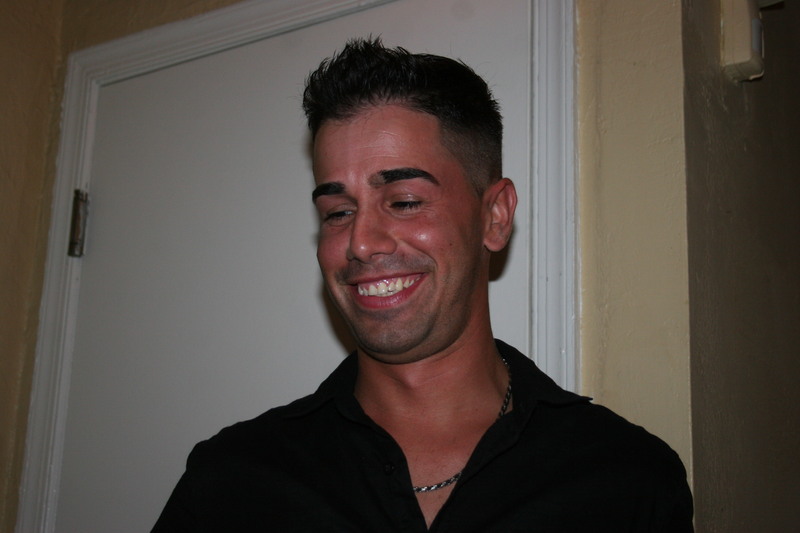 Later, I will mention one more trait that sets Steve apart from his compatriots in the industry. 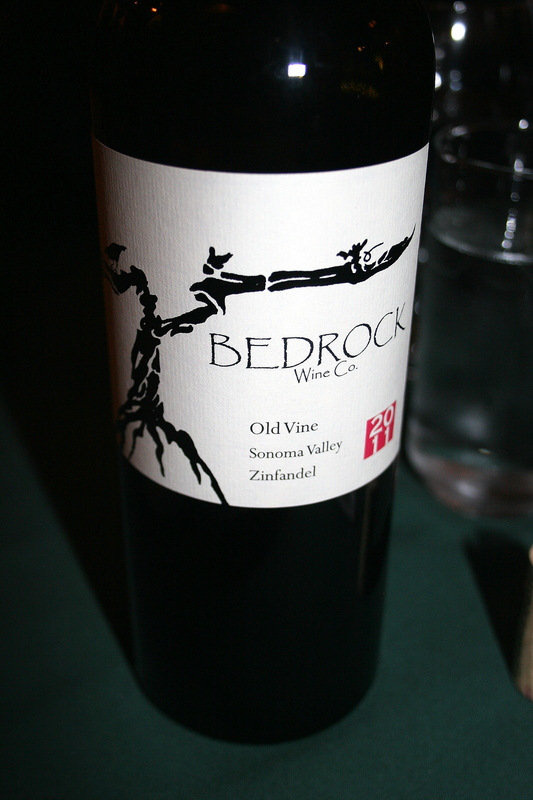 As usual, we had some very nice wines with us to serve as appropriate beverages for our meal. Gerry provided the 2005 Los Astrales Astrales Christina, Ribera del Duero, Spain. This was a big, bold Spanish red rated 97 by the Wine Advocate and not often seen as there were only 150 cases produced. Intense flavors of leather, licorice and blackberry fill the palate and linger long after the swallow. Made from 100% Tempranillo, this was my favorite wine of the evening. John chipped in with a 2003 Arrowood, Sonoma County, Cabernet Sauvignon. 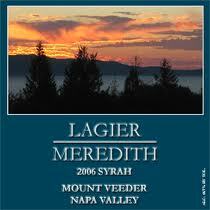 Lots of dark fruit, well-balanced with soft tannins and a medium finish. Perhaps just a nuance of mint. Went well with several of our dishes. My contribution was the 2007 Phillips Hill, Oppenlander Vineyard, Pinot Noir, Mendocino County, CA. Lots of black cherry fruit and earthiness in this smooth Pinot Noir. Nice lingering finish; a nice wine. 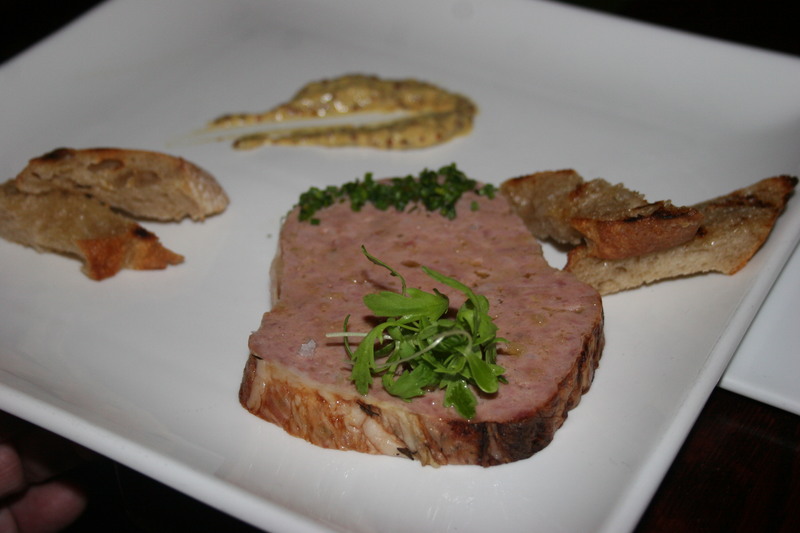 Narrowing your choices from the menu at Fond is no easy task. Chef Lee Styer (just back from his marriage and honeymoon to Pastry Chef Jessie Prawlucki) puts forth more than a few exotic offerings that will tempt your palate. Steve explained that their was one small course of octopus remaining so we shared this between the three of us. 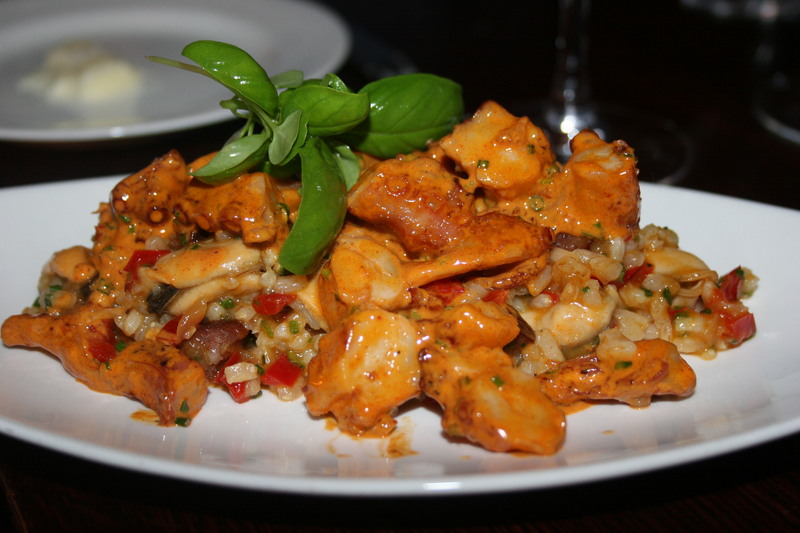 The perfectly grilled octopus was served with Spanish rice, chorizo and mussels and the presentation was beautiful. John was delighted to find the Escargot on the menu. 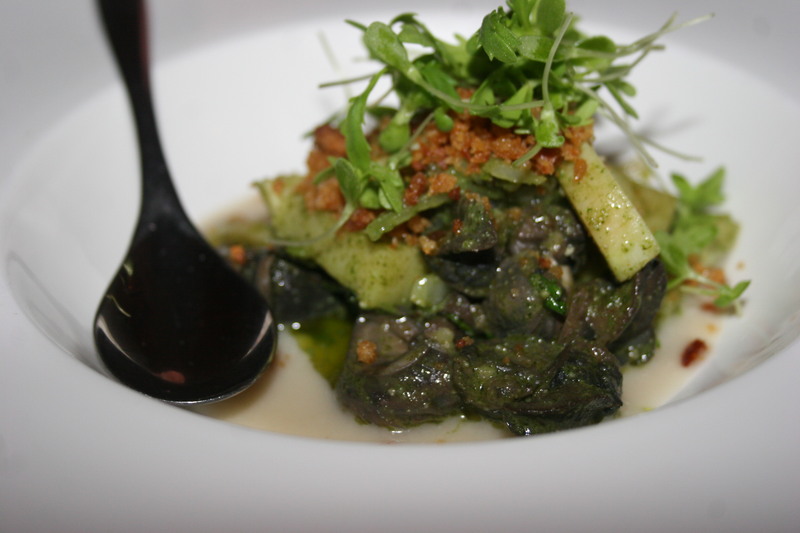 The delicate snails were served with hearts of palm and fennel in a mint pesto sauce. His silence while devouring his appetizer was proof enough that he was quite happy with his choice. Gerry wasted little time in choosing the Foie Gras Pate served with toasted croutons and a mustard sauce. 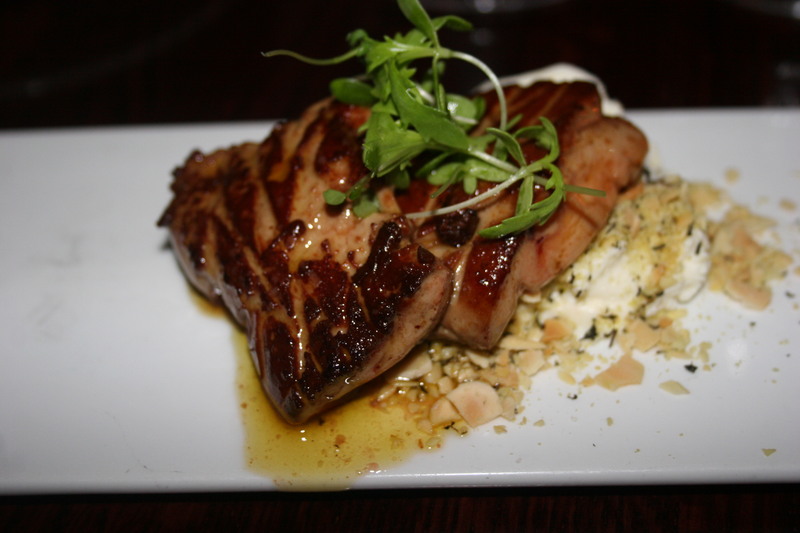 I, too, could not resist the Foie Gras but I had mine seared with rhubarb, lemon-ricotta and almonds. 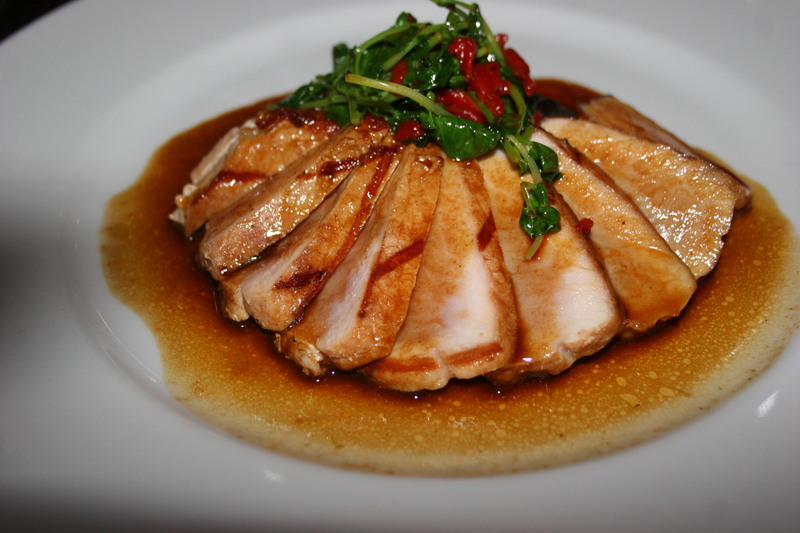 This tender French delicacy was cooked to perfection and an excellent start to the meal. 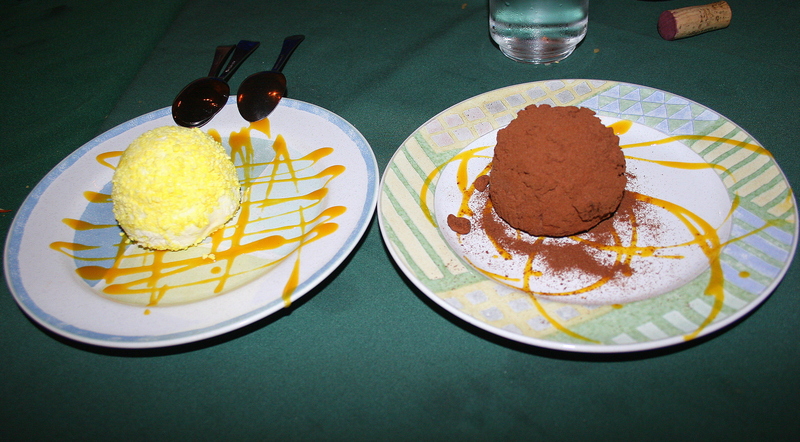 Two different ways to serve this dish and both Gerry and I were pleased with our choices. For our entrees, Gerry left the menu and went with one of the evening specials. He settled on the Roast Quail stuffed with, what else, foie gras. 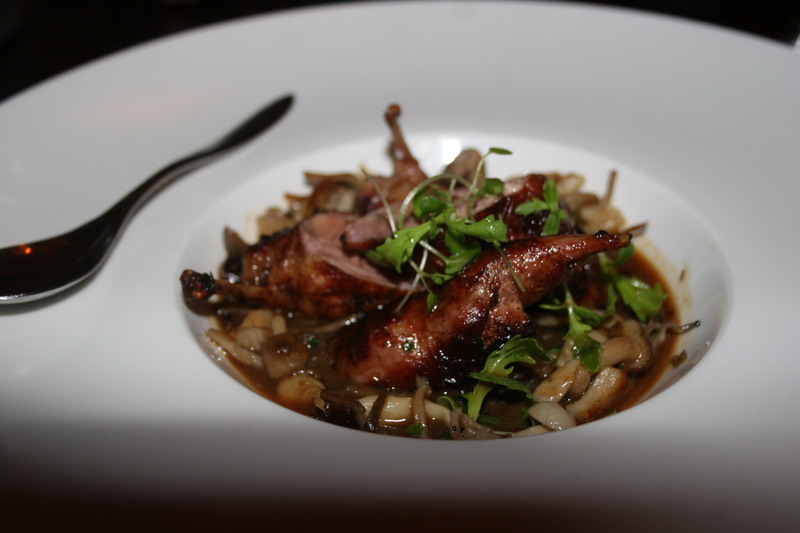 The quail was cooked nicely and the sauce was a perfect marriage with the delicate bird. John thought long and hard before making his choice. 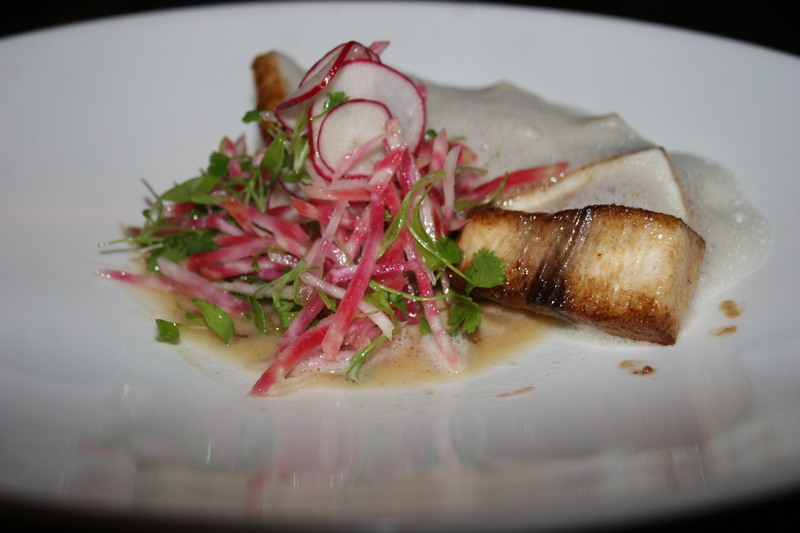 He went with the Harpoon Caught Swordfish, served with gold beets, radish salad and lemon grass sauce. I can’t vouch for the harpoon as the weapon that captured this fish but I can vouch for the fact that it was cooked to perfection and that John was absolutely thrilled with the rich flavors of the entree. I had thought about the swordfish. I had not considered the quail. My eyes kept returning to the Pork Loin and that’s what I finally decided on. 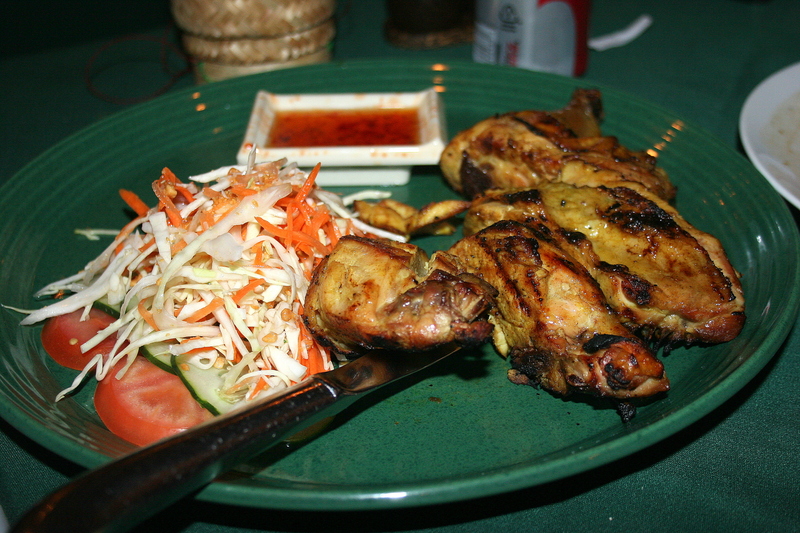 It was a fine choice as the meat was tender and juicy. 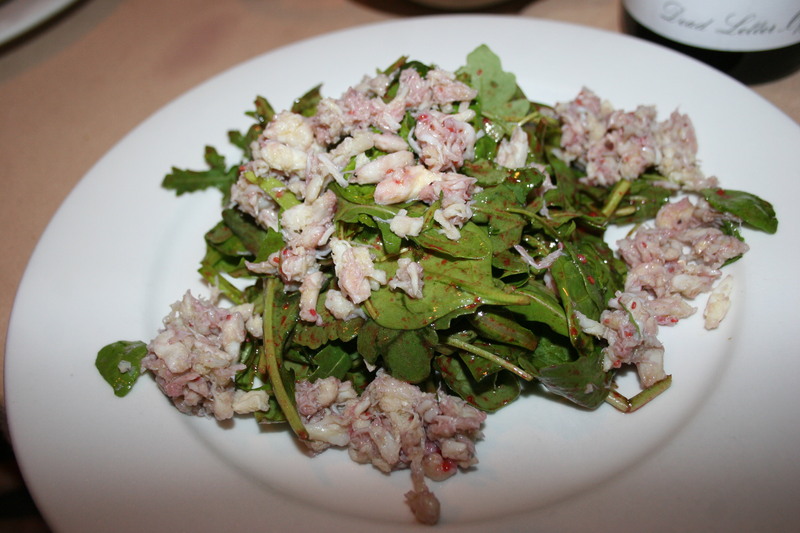 It was served with roasted red peppers and arugula and the dish was plentiful. All three of us were content and happy with both the great food and superior service. I had mentioned earlier that our server, Steve possessed one other quality that made him stand out from others. He has an uncanny knack of knowing each customer quickly. By that I mean, he is able to almost instantly know who he can joke with, who he must be serious with and just exactly how far he can go. This may seem like not much of a big deal but to me, it makes all the difference in the world. It was obvious he felt comfortable enough with us to offer his personal opinions of each dish and even trade barbs with us. 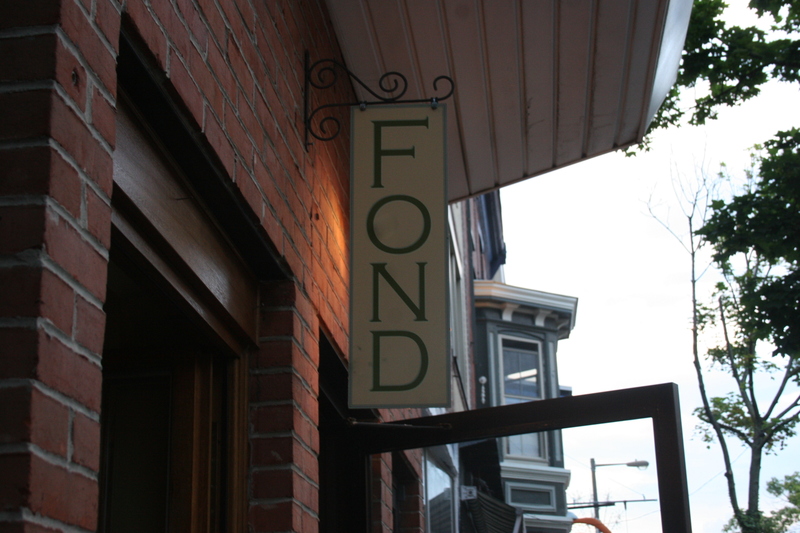 It was like being waited on by a good friend rather than a stranger and I think I speak for both Gerry and John when I say he played a big role in making our dining experience at Fond a memorable one. I had read so much before we got to Fond about the dessert “brownie” that I was quite disappointed to find there were none on this Thursday evening. 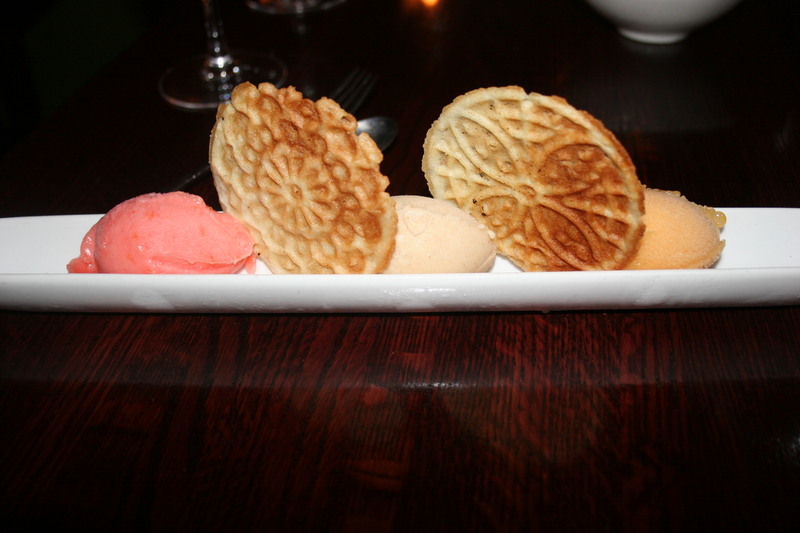 John went with the Triple Sorbet of tropical ices with a couple of waffle cookies and he found it a nice ending to his meal. Gerry’s dessert was picture perfect but I can’t remember what it was except that it had a fruit filling with a tart and some creme fraiche. I also remember that he liked it a lot. 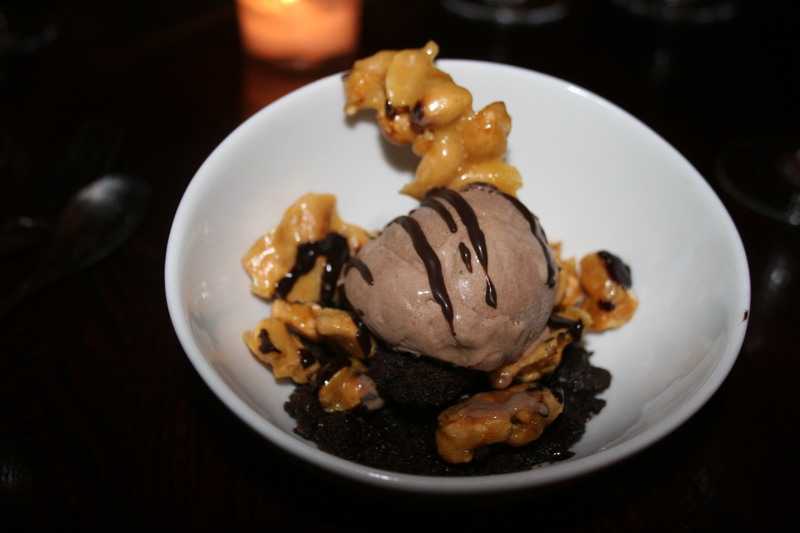 With the much-anticipated brownie not available I went with the Malted Milk Chocolate Ice Cream, peanut brittle, chocolate crumble and peanut butter ganache. It was almost good enough to make me forgive the absence of the brownie. Our dinner at Fond was absolutely wonderful. 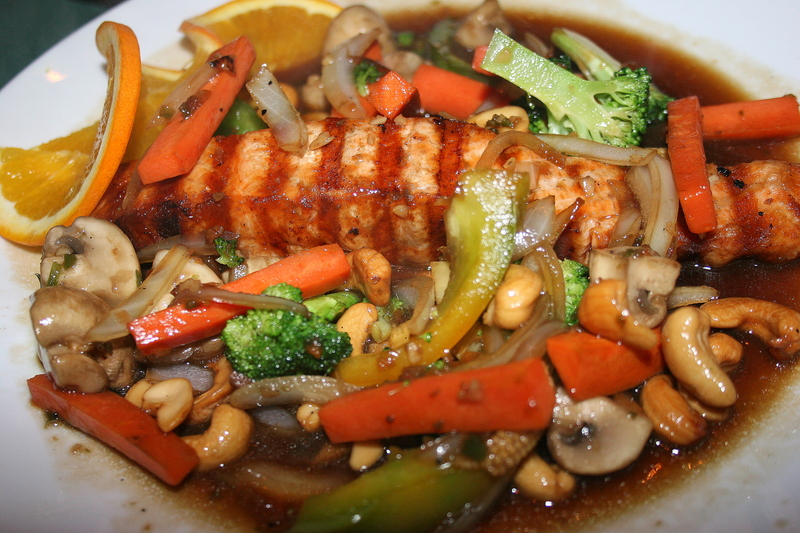 Chef Styer is a marvelous chef and the atmosphere is warm and friendly. Seating is limited to 34 hungry foodies on any given night so make sure you make reservations early. Steve had suggested that there was an outside chance we might find one of those elusive brownies up the street at Belle Cakery, if they were still open. We lucked out and they were open and although they had no brownies, John and I were able to pool our remaining cash and pay the women there to have their picture taken with Gerry so that in years to come he can look back and pretend he actually did something with his “hall pass”. Thank you, ladies, our money was well spent and we appreciate your sacrifice.